Are you currently implementing SharePoint? Have you implemented SharePoint and now you are pulling your hair out? Did you hire someone to stand up your farm, now they are gone, and you have no clue what to do? Are you generally lost and cursing SharePoint with every other breath? Does your boss not get SharePoint? Are you a boss and don’t get it? Are you looking at spending thousands of dollars on training just to be able to use SharePoint? If you are Jerry Seinfeld, is SharePoint your Newman? Congratulations! You are now part of an ever growing community! Whether you know it or not, thousands upon thousands of people are struggling with the exact same problems you are. They are hating SharePoint and don’t know exactly where to turn. Until you are knee deep in SharePoint and ruing the day it was created you really can’t quite comprehend what an absolute beast SharePoint is. This thing is a monster and it will eat you alive if you are not prepared. A good way to understand that SharePoint is a massive beast is to ask the question “What is SharePoint?”. The correct answer is “What do you want it to be?”. Most people don’t realize that NO ONE is an expert on every facet of SharePoint. I don’t think it’s humanly possible. I’ve met a few geniuses who come close, but even they have people they rely on for some aspects of SharePoint (I’ll refrain from naming names so as not to grow any egos, but you know who you are). Think about it, you have SharePoint Administrators who are in charge of maintaining the farms from day to day. SharePoint Developers who sweat blood to develop solutions to cleanly integrate into your business systems and make everything seamless. SharePoint Architects help you structure everything and decide where it goes so that everything doesn’t implode on you in a couple of years. Branding experts know how to wrestle with themes, navigation, and style sheets to make SharePoint “not look like SharePoint”, and trainers who teach your End Users how to use SharePoint. You’ll have SQL admins responsible for the health and back up of the SQL Servers on your farms. You SHOULD have a SharePoint Governance Committee so people are not haphazardly creating garbage all over your farm. You may even have a SharePoint Search admin who’s sole purpose is to make sure your SharePoint Search is configured properly and performing well. In some companies you need 2 or 3 of each of these guys! Have you priced a talented SharePoint person lately? They aren’t cheap. You definitely get what you pay for. Are you starting to get an inkling for how ginormous SharePoint is? Are you? ARE YOU??? So, what do you do? What hope do you have? Well, you have a couple of options! Let’s look at those, shall we? If you are lucky enough to have spare money lying around then training is always an option. When I started with SharePoint in November of 2007 training was really not up to par yet and we had a couple of bad experiences. However, that has changed in the past year and there is some really great training out there. I can personally recommend Critical Path Training (Formerly Ted Pattison Group). These guys know their stuff, and the lab manual you get out of it is almost worth the cost of the course. AC is one of those aforementioned geniuses. The one issue I have with organized training is they don’t always equip you for when SharePoint doesn’t do what it’s supposed to do (which seems to be A LOT of the time). I swear if I had a dollar for every time I saw a page that said “Unknown Error” I would be lounging on a beach somewhere. GREAT error messages Microsoft! 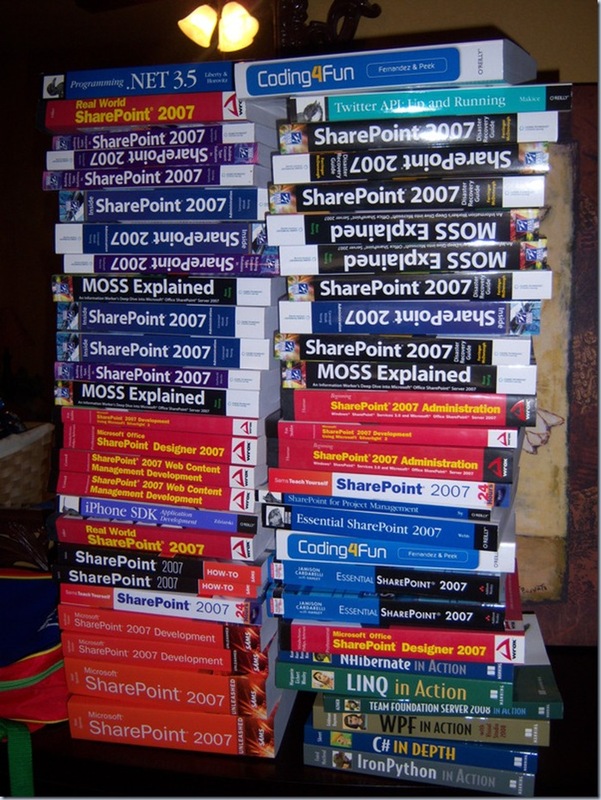 There are SO many SharePoint books that it’s an obvious first step to learning SharePoint. Just look at SOME of the books I’m giving away at SharePoint Saturday Ozarks on July 18th, and these only scratch the service! The downside with books is that you have to read and read and read. Also, you can’t ask questions as you go. So, if you get lost, you are lost. Ahhh.. this gets me to the point of this blog. The SharePoint Community: if you are not involved then you are wasting valuable time and money. There is this large group of people who know where you are, know where you are going, and know where you SHOULD go and they are more than happy to help. I have not seen anything quite like it before. It’s very much like a support group. “Hello, I’m Mark, and I work with SharePoint.” If you have a gripe, someone else has griped about it. If you have an issue you can’t resolve and you can’t find the magic google word combination to find the answer, someone in the SharePoint community knows the answer. You can either spend weeks and weeks on a problem or you can get involved in the SharePoint Community and find the answer in minutes. I personally struggled in my organization searching for answers on how to do the most basic things in SharePoint for almost an entire year. I bought books, attended HORRIBLE training, searched online, and pretty much understood what deep depression was all about. It was my job to implement SharePoint and I could find no clear path. This started in November of 2007. Then, in October of 2008 I attended the SharePoint Track at the Tulsa TechFest. The knowledge I gained in those two days by far outweighed everything I had learned in the previous year. The people I met are worth their weight in gold, and I finally started to understand SharePoint. AND IT WAS ALL FREE!!! Okay, I had to pay for my meals and hotel, but other than that it was free. I have since built on those relationships and have an extensive SharePoint network that has led to my company hiring a very talented SharePoint Administrator (@lorigowin) and connected me with SharePoint experts all over the world. When I have a problem and can’t find the answer, I easily reach out to this network and find answers in less than an hour. Do you realize what that’s worth? You absolutely cannot put a price on the friendships and connections I have made in the SharePoint Community. Why do they do this? Why do they help? Well, there are several reasons. These people are passionate about SharePoint and truly “evangelize” the product. Also, they have been where you are and would not wish the pain they went through on their worst enemy. The very fact such a network of tremendous individuals exists and is so helpful is a testament to how massive and daunting SharePoint is. So, how do I get involved in the SharePoint Community? It’s actually quite easy to get involved in the SharePoint Community and as I say over and over these guys are the most helpful people in the world. Start following SharePoint people on Twitter. Look at who I’m following as a good start: @mrackley. Watch what these guys are posting and you’ll get the latest news on SharePoint. You’ll find out when patches and Service Packs are being released as well as any issues that arise with these patches and Service Packs before most people. In some cases, you’ll learn things about SharePoint before Microsoft wants you to know them. :) Also, these guys are really helpful when you have a problem you can’t solve. Don’t be a leech though, if you see someone struggling with a problem you had, help them out! It will be appreciated and noticed. There are A LOT of free events out there. Check to see if there is a SharePoint Saturday near you. These events are totally free and the knowledge you gain from attending and the worth of the contacts you meet there cannot be calculated. Yes, these events are free. No, it’s not a sneaky way to sell you something. As I stated earlier I’m organizing a local SharePoint Saturday event on July 18th (SharePoint Saturday Ozarks), and I called some people I knew were just starting with SharePoint and they told me “We are not looking for training right now.” I wanted to reach through the phone and slap the person a couple of times. These events are a phenomenal way for you learn things you would not otherwise have the chance to learn. It’s a chance to meet people who truly know SharePoint and will be more than happy to help you after the fact. AND IT IS FREE! If you are within driving distance to one of these events and you are not attending then you are making a huge mistake. If I could slap you right now I would! It’s asinine. These are not Amway conventions. People are not trying to get you to spend money. They are sharing their knowledge in an effort to help you. How can you turn that down? There are many other great events other than SharePoint Saturdays as well. Check out Microsoft Events and see if there are any events in your area. It’s not an option. Do it. If you don’t, you deserve your fate. Can I be more clear? When you start to get a little knowledge, give back. Start a blog and share your experiences. It earns you some street cred with the SharePoint gurus and gives you a great reference for when you run into the problem again. You can’t be an island in SharePoint. Give back. Even if you think it’s something small, you might be amazed at the results. My second blog I ever wrote was about some random thing I figured out and found a little useful. To this date it is my most popular and commented on blog, and I just wrote it as an aside! You never know what someone else may find invaluable! Yup, agree with you totally. SharePoint is too big to know, especially as it is sometimes a bit 'quirky'. It's easy to get frustrated with, or stuck on a problem. The thing that makes this all bareable is the community. I started working SharePoint (of any version) with 2007 Beta 1. Documentation - none. Training - none. Blog posts - very few, but the ones there were were gold. And then that community documentation started to grow, and at a pace that far outstrips 'official' documentation. Also, 'cos it was written by people trying to do the same things as me, it was so much more relevant; now, I can't imagine working without Google and blogs to inform me - and like you say, it's good to give back. And yes, you never know what blog posts will be popular. I blogged about Breadcrumbs in SharePoint 'cos I couldn't figure out what the heck was going on with them - this is one of the most popular items my blog - I'm still surprised by that. I live in Youngstown, OH and I would LOVE to attend some events but there never seems to be anything even sort of close to me. If anyone knows of anything in this area PLEASE let me know!!!! I had never worked with SharePoint at all until my previous CEO literally droped the project in my lap. He set up one out of the box team site and said here you go, design and implement SharePoint for the company. Now nearly two years later I love working on our "Team Site". However, not being a programer, although I am in IT and have a basic understanding of programing, I have so much to learn, and no training budget to do it. I read books and such, but the blogs and community have been my greatest source of information.. I appreciate EVERY piece of information and ALL the help I have received. Thank you!